How does it feel to be America’s problem? I thought about that quote from author/playwright/activist Amiri Baraka as I read, heard or saw commentary on the school transfer saga. Baraka’s rhetorical, yet poignant question, suggests that post-slavery, America doesn’t know what to do with its black population. It doesn’t need them, it doesn’t want them. Black kids in the St. Louis region have been hearing themselves discussed by adults/institutions who don’t want them. Yeah. I bet Rose wished that black folks would also disappear. Check out my piece on school transfers. Click here. Some Friends had seen it but many had not. Reasons given were from it’s too close to the Trayvon Martin verdict (still working through that pain) to they hadn’t heard about the movie. If enlightened folks didn’t hear about, then you know our young people missed the cues. I’m very familiar with the actual Fruitvale Station. When I would go to Oakland, I often got off at the “Fruitvale” BART stop to visit friends. I’ve stood on that platform. I could’ve witnessed that horrific crime. . However, for most folks the movie title Fruitvale Station is meaningless. 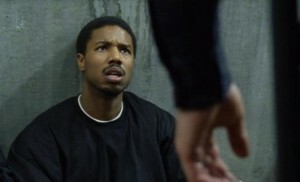 There had to be some discussion among the movie stakeholders about the ambiguity of the title as it was first going to be entitled “Fruitvale.” Adding “Station” didn’t bring a whole lot of clarity either. We need to help in the promotion and marketing of this movie for several reasons. One, I believe in supporting folks doing the right thing. Black writer and director, Ryan Coogler, is an up and coming figure. If we want to ensure that he continues on his current path of producing positive films, the box office is the litmus test. Yeah, cha-ching, cha-ching. The second reason I think the movie should be promoted is that it is a small, neutralizing drop in the sea of negative stereotypes of young, black males. One of the reasons Coogler wanted to tell this story is because like a lot of young, black men whose murders we hear or see in the media, viewers only get that one dimension, divorced from family, friends and a community. We really never know the multi-dimensional person unless we knew the youth personally. Let’s do what we often do well–tell our friends, our church members, our frat brothas and sorors, our co-workers about the movie. We must bump up the attendance in theaters this weekend or the movie will move on. 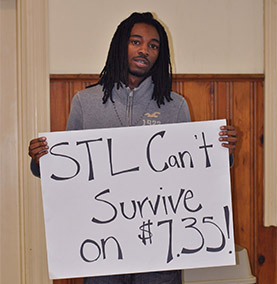 Join me today to support the growing movement to demand livable wages for fast food workers. The rally is today, July 30, from 4:3o-5:30 pm at Keiner Plaza, downtown St. Louis. You’ve heard their personal stories. I’ve written about their struggles. Now, we need to building the pressure on the fast food industry which is making billions off the sub-standard wages of these workers. St. Louis is part of the national media conversation so let’s represent!